There is a variety of excellent reference books available. Many of us enjoy watching The Antiques Road Show and the unique stories that accompany the artefacts. Virtually every artefact has a story to tell, and a little research can reveal some of those stories. This article will offer some tips on how to discover more about the history of your antique phonograph. A few years ago, I purchased an antique phonograph cabinet at a garage sale. I was curious about its past, and decided to learn more about its history. I discovered that my phonograph had been manufactured by a small Toronto company called the Regal Phonograph Company, Ltd. During the course of my research, I found that the company existed only seven years and that the owner had twice been arrested for fraud! I also learned a great deal about the phonograph industry in Canada. I shared my findings with CAPS readers in the January-February and March-April 2006 issues of CAPS Antique Phonograph News. Although this article is written specifically about phonographs, much of the basic research information could be applied to goods manufactured in Canada between the late 1800s and the 1930s. Before I begin, I need to make one thing clear. I am offering information on how to research the history of your phonograph, not its provenance. Provenance is the ownership history of a specific artefact. It is established through receipts and invoices (such as a bill of sale), photographs, correspondence, auction catalogues or any document that indicates who owned your phonograph at a particular point in time. If your phonograph has been passed down through your family, you may know quite a bit about its provenance. Artefacts with a known provenance, especially a famous provenance, are often more valuable than artefacts with an unknown past. On the other hand if, like me, you bought your phonograph at a garage sale, little, if anything at all, will be available about its provenance. And unless you discover a receipt tucked into the cabinet somewhere, you probably never will know. 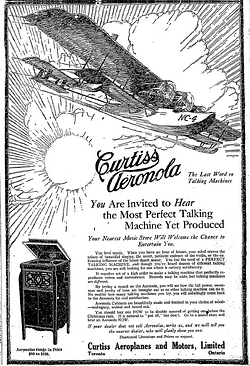 On the 100th anniversary of powered flight in Canada, we note that Curtiss Aeroplanes & Motors manufactured the Aeronola talking machine in Toronto. Globe & Mail, Nov. 29, 1919, p. 18. The history of your phonograph is the more general story about who manufactured the phonograph, how it was made and possibly, even when. History can provide you with interesting stories about, and a better understanding of, the company that made your phonograph and the era in which it was made. First, start with your phonograph. Does it bear a manufacturing mark or a decal? Every bit of information may be important. My Regal phonograph had a brass plaque on the back that identified the name of the company and the city where it was manufactured. That plaque was key to beginning my research, since it offered important clues on where to begin. Once you have some basic information, like the trade name of the phonograph, a company name or a place of manufacture, you can begin to look for other sources of information. The local library and the internet are both important places to continue your search. Books, articles and websites can provide you with a lot of information about antique phonographs. A great deal of excellent literature has been written on phonographs and phonograph manufacturers. If you own a Victrola, a Columbia or an Edison, you may not need to go much beyond these sources to find out almost everything there is to know about your machine. But if you own a more obscure model manufactured by a smaller company, you may need to do more research. Books, like Edward B. Moogk’s Roll Back the Years: History of Canadian Recorded Sound and its Legacy (National Library of Canada, 1975), or the numerous articles and book reviews in the CAPS Newsletter may provide you with a few additional pieces of information that will contribute to your overall search. The most useful research sources, after reviewing books and websites, are city directories, newspapers and trade journals. A review of these three primary sources should give you a pretty good idea about the history of the company that manufactured your phonograph. Selection from a city directory, Lovell’s Montreal Directory 1921-1922, Montreal: John Lovell & Son Ltd., 1921, p. 1917. City directories are an annual alphabetical listing of businesses and residents of a particular town or city. There are city directories for all the major cities and many large towns across Canada. City directories also include a street directory and an advertising section where companies paid to advertise. Similar to telephone books, directories were used as an advertising and marketing tool, and promoted the amenities and industrial development of a city. If you know the place where your phonograph was manufactured, the local city directory can provide you with important basic information, such as the street address of the firm and the names of the owners or executives of the company. 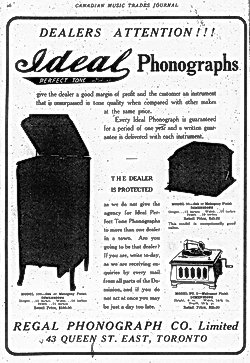 Advertisements can provide more information about the company, including phonograph model and price information. Be sure to check various headings, like "Phonograph, Talking Machine" or "Musical Instruments" when looking for advertisements. By reviewing a directory over a period of time, you can determine the approximate dates for the start and demise of the company and any changes over time. City directories are available in most libraries (on microfilm if not in book form). Library and Archives Canada is making some city directories available online at http://www.collectionscanada.ca/canadiandirectories/index-e.html. Newspapers and newspaper advertisements can provide invaluable detail about a phonograph, including line-drawings, model information, clues about the manufacturing process, information about component parts, retail stores and more. You may even find related news items, obituaries and bankruptcy notices that reveal more about the phonograph manufacturer and the history of the company. Newspapers are time-consuming to review, so it is best if you already have a date range in mind before you start your search. Most newspapers are available on microfilm through public libraries via interlibrary loan. Some newspapers are now available online in searchable databases, including the Toronto Star, the Toronto Globe/Globe and Mail, and many others. These searchable databases are usually a subscription-based service, but some large libraries provide access to their patrons. Their database search engines are good, but not perfect. Be aware that you may miss valuable information if you rely on only a few terms typed into a database search box. 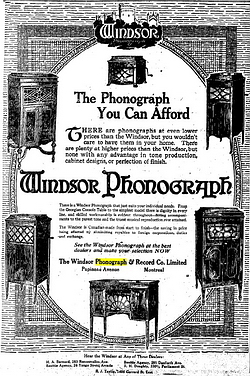 Windsor Phonograph advertisement, Toronto Star, Saturday, November 6, 1920, p.10. Trade journals are news sources published by and for specific industries. These magazines contain information about new developments and technology in the industry, the impact of government policy and corporate information, such as the establishment of a company, its expansion, a new factory or its bankruptcy. They also usually include industry gossip, including marriages, deaths and career changes. They are an important source for industry advertising. Since the advertising was aimed at retailers, rather than the general public, the information contained is often more detailed than that found in newspapers. The Canadian Music Trades Journal was the industry magazine for phonograph and record manufacturers in Canada between 1900 and 1933. Trade journals are generally available only in the larger, specialized libraries, but many of the older journals (including the Canadian Music Trades Journal up to about 1920) have been microfiched and are available to borrowers via interlibrary loan. For those curious to know even more, there are numerous other sources that may be useful in tracking the history of your phonograph. Some are more readily accessible than others, but these sources can provide different kinds of detailed information about phonographs. For example, trademark and patent information are available online through the Canadian Intellectual Property Office website, at http://strategis.ic.gc.ca/sc_mrksv/cipo/welcome/welcom-e.html. Their trademark database includes registered trademarks from 1865-20061, while the patent database currently contains patents from 1920-2006. The patent database includes corporate information as well as scanned copies of the complete patent (description and illustrations). The patent database is a useful resource in determining technical advancements in talking machine or phonograph design, particularly if they are related to your phonograph. Trade catalogues, brochures, manuals and advertisements are other helpful sources of information on specific phonographs or phonograph parts. 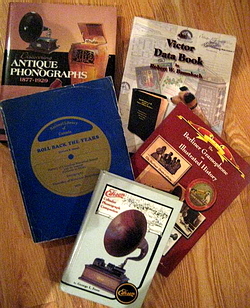 Catalogues for the major phonograph manufacturers are frequently available on e-Bay, but it is more difficult to find materials for small Canadian manufacturers. The libraries at the Canada Museum of Science and Technology, Library and Archives Canada and a few other specialized reference libraries have significant collections of these rare and useful documents. 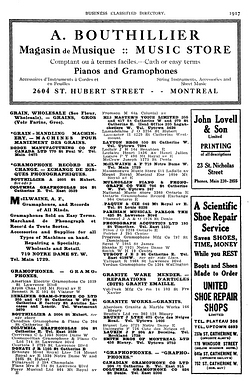 Regal Phonograph advertisement, Canadian Music Trades Journal, February 1917, p.26. Additional sources include corporation files which contain most of the documentation received by the government about the corporation, such as correspondence, drafts of the letters patent, orders-in-council and other documents that will indicate who was involved in the company and what it was permitted to do. A company may incorporate at the federal or provincial level, and corporation files are usually found at either Library and Archives Canada, for federal incorporations, or at the appropriate provincial department or archives.2 On the opposite end of the spectrum, corporate bankruptcy files can often also be found in provincial archives. These files can tell you about the sad end of a phonograph company. At the local level, in municipal archives or city offices, old tax assessment rolls can provide information about the individuals who worked for a company, including their specific occupations. This information may be useful in determining how your phonograph was manufactured. Maps and plans, particularly fire insurance plans, are helpful in determining the size of the factory or manufacturing facility. Again this may help you determine how large the company was, and give you a rough idea of its manufacturing capacity. As you learn more about the history of a phonograph company, one source may lead you to another, and you will slowly be able to piece together a history of the manufacturer of your phonograph. You may research as much or as little as you choose, depending on what you want to know about your phonograph. Here are a few tips about doing good research that will be helpful as you trace the history of your phonograph. First, keep notes. Write everything down, or make photocopies of the information you find. It will help you remember what you learn. Equally important is writing a proper source citation for each piece found . For every book, newspaper, or website that you review and for their photocopies or printouts, it is very important to record the basic information about that source. That information includes the author, title, date and page number or web address. This information will allow you to know where the information came from and, if required, you could look it up again. Finally, you will need to organize your research. Keep it in an envelope or in several file folders, but keep it together. You may even want to write a little summary or a chronology just so you will remember the details of your research. I had a discussion once with a phonograph collector about his passion for antique phonographs. He loved to recreate his machines and listen to the wonderful music they produced. He was interested in the history of his machines, but it was of secondary importance to him. I, on the other hand, am passionate about the history, and my curiosity is not satisfied until I can uncover every possible source of information. Whether you are a passionate history buff, or a passionate collector, knowing something about the history of your phonograph can only improve your understanding of the machine. It is my hope that this article will serve as a useful starting guide in that quest. And the next time your friends or guests admire your phonograph, you can play a few records and tell them some interesting stories about your phonograph. Not all trademarks (even commonly used trademarks) were registered. Non-registered trademarks are more difficult to locate, but many are found at the Library and Archives Canada in Ottawa. See the Canadian Intellectual Property Office fonds, Trade-Marks Office records (RG 105) for trademark applications, 1901-1918. For federal incorporations, see Library and Archives Canada, Corporations Branch sous-fonds (RG 95). Some provincial departments keep their corporation files for a long time, even if the company has long since gone bankrupt. The provincial archives should be able to direct you on how to obtain information still held by a government department. Jennifer Mueller is a Senior Program Officer at the Department of Canadian Heritage in Ottawa.